What Types of Organizations May Be Accredited by IMPA? Organizations must teach with professionalism, integrity, insight, and respect for the higher good and benefit of their students. Organizations may conduct courses online, in a physical location, distance learning via mail, or any combination thereof. An instructor must be reasonably available to students during course studies. Topics must possess quality content that does not violate the IMPA Code of Ethics. Courses must have professional presentation (course materials have a professional appearance). Course materials must be well written and generally free of typos, grammatical, and punctuation errors. Curriculum must effectively prepare students with the professional competencies for which it was designed. o An attitude of continual improvement must be maintained with regard to curriculum. o Student records and transcripts must be maintained for a minimum of seven years. o Valid transcript requests must be answered and a copy mailed/provided within seven days. Organizations must adhere to the letter and spirit of the IMPA Code of Ethics. Organizations must adhere to the IMPA educational standards outlined in the section above. Organizations must demonstrate business stability. IMPA prefers that an organization be in operation for a minimum of one year, but will consider organizations that have been in operation for less time provided stability can be shown on the part of the applicant, i.e., past or present successful and stable organizations founded by the applicant. Organizations must be grounded in reason. This means that IMPA will not accredit organizations that promote fear, promote concepts that are strictly faith-based without a compelling scientific or rational foundation, promote concepts that are on the extreme fringe of metaphysics, or otherwise promote concepts that result in an organization ultimately doing harm to its students. Organizations must have a website with a professional appearance and content that does not violate the IMPA Code of Ethics. The Founder, President, CEO, Owner, of the organization must be a Professional Member of IMPA in good standing, and acts as the Principal member or agent of the organization for accreditation purposes. The Principal’s membership must be maintained for continued accreditation status. Employees of an organization who are IMPA members cannot apply for accreditation on the organization’s behalf. A typical course curriculum for review. Alternatively, if the course is in an online format, access can be temporarily given for review purposes. A copy of the organization’s Mission and Vision statements. A copy of the organization’s Charter, if applicable. A copy of the member-applicant’s résumé or CV. A telephone interview will be conducted with the Principal member to verify application details and answer any potential questions from the discovery and review process as well as questions from the applicant. Accreditation requirements may be updated as needed and Accredited Organizations agree to abide by any updates to IMPA’s standards. The application process takes one to two weeks to complete and consists of three basic steps: 1) Submitting the application; 2) Discovery and review process; and 3) Accreditation approval or denial. Applicants should compile all necessary documents and information before completing the accreditation application. Applicants must complete the online Accreditation Application and submit a non-refundable application fee of $50.00. In most cases, if accreditation is declined, the applicant will be given the opportunity to correct any deficiencies within 60 days at which time the application will be reviewed again. If the application is declined a second time, the applicant will need to make necessary corrections and reapply for accreditation. If accreditation is approved, a fee of $150.00 must be submitted before accreditation can become official. Accreditation will then remain active for the accreditation period so long as the applicant’s membership remains active and in good standing. 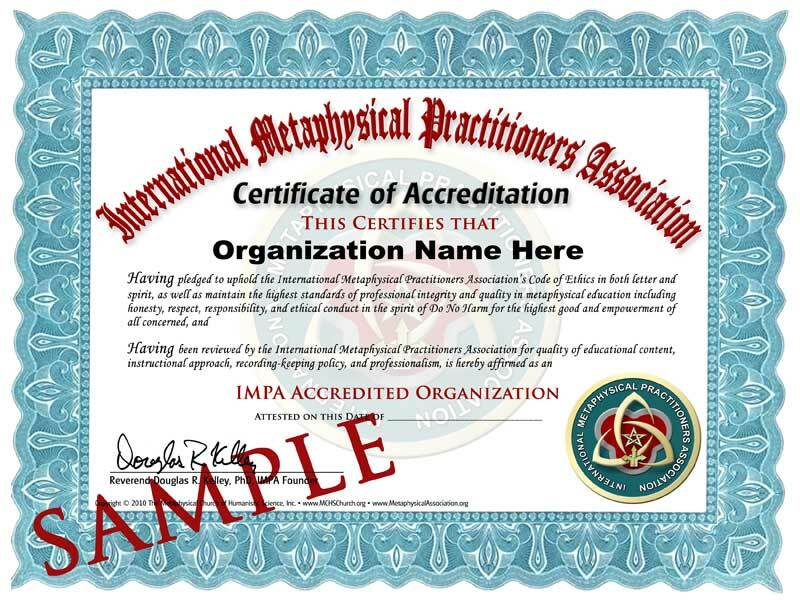 Once accreditation becomes active, the member will receive a Certificate of Accreditation in PDF and jpg as well as the official IMPA Accreditation Badge website graphic. The certificate and Badge may be used in printed materials and the Badge must be used on the member’s website to let prospective students and others know of the organization’s official accreditation status. In addition, the organization will be listed on the IMPA website as an accredited organization. Accreditation is good for the lifetime of the Principle member. Official accreditation status ceases if the Principal’s membership is canceled by the Principal member or is terminated by IMPA Admin. In the event the Principle’s organization is sold or ownership is transferred, the new owner-Principal must join IMPA and reapply for accreditation. Random checks may be conducted from time to time on Accredited Organizations to ensure compliance. This may include a website review, a request for a current curriculum, or some other valid and relevant request. Accredited Organizations agree to comply with any requests made in the performance of a random check within a seven day period. Accreditation and membership may be terminated by IMPA Admin for any violation of the IMPA Code of Ethics, or three or more valid complaints filed against the organization. In the event of termination by IMPA Admin, the organization and Principal member will no longer be eligible for accreditation or membership.